This was a quieter week of board gaming while we are on a small hiatus from our T.I.M.E Stories expeditions. We haven't set a length yet and while we are all itching to explore the Prophecy Of Dragons, we feel it'll serve us better in the long run so not to tire out the explorations. Hollywood - After finally trying this game last week, this week I got the chance to introduce it to some new players. All fans of 7 Wonders, Hollywood was enjoyed for a bit of a different twist on the card drafting genre but unanimously agreed upon that the aforementioned is the better game. Is it worth owning both? Most likely not. 7 Wonders with its expansions come together to create an epic fast played game, where as Hollywood is more a lighter fun distraction. There are a few nice additions including a well thought auction mechanic (most likely in other games but this is my first introduction to doing it this exact way), and of course the movie of the year award which does actually feel nice winning. Unfortunately I'm not the best at Hollywood and finished third (out of four), but enjoy it enough that there's still one or two more people I'd like to introduce it to and can imagine the odd play in the months to come just for a bit of simple fun and variety. Codenames - Last time I played Codenames I really felt like I failed. Originally I considered myself half decent at this game but with my last few sessions I'm beginning to question my ability to string 3-4 word clues together. Luck of the draw has a lot to do with this, yet somehow if your clever enough there should almost always be a way to work around this. Somehow I managed to be on the winning team for most of the night, but I can't take the credit for it this time. People ask me about Codenames Pictures and I can't actually comment as I've never tried it. My personal thoughts are that while it may be as clever, I'm happy playing the original and feel no need to venture any further with any variations. For now anyway..
Terraforming Mars - OK. I caved. Terraforming Mars has been sneaking its way to the top of the BGG charts and currently sits in the top 10 placed at position 8. I haven't yet had the pleasure of taking the journey to Mars, but have read enough reviews, thoughts and impressions to think that this is a game I'd enjoy. This week I had the opportunity to buy Terraforming Mars for $70! For those in Australia, I'm sure we'd all agree that is a bargain. So as much as I want to show the rest of the library some love - sometimes you have to make the most of the opportunities your given! 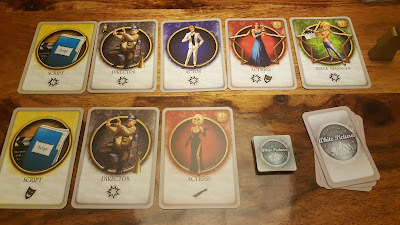 The biggest complaints with this game tend to be the poor quality components and the artwork. If that's really all you can complain about in a game and it ticks all the rest of the boxes - I'm fairly confident I could be playing a new favorite of mine very shortly!